2K Games announced today that the PC version of Duke Nukem Forever will use Steamworks and also took the wraps off some awesome truckin' preorder bonuses. It seems like just about every new videogame these days has some kind of preorder bonus and Duke Nukem Forever is no exception. Hot on the heels of news about the Balls of Steel Collector's Edition comes word of two unique preorder offers, one from GameStop and one from Walmart. Lay down your bucks at GameStop and you'll get Duke's Big Package, a downloadable content collection that includes an in-game EGO boost (I have no idea what that is), "Big Head Mode" and a virtual t-shirt pack. 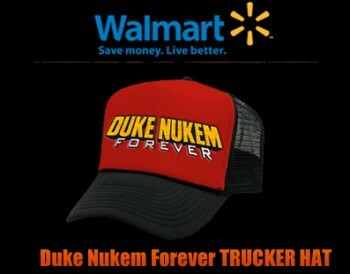 Even better, in my ever-so-humble opinion, is Walmart's wildly appropriate offer of a Duke Nukem Forever Trucker Hat! That's right, a real-life DNF big rigger lid that's sure to make you the envy of all the other kids on the block! Gearbox Community Manager Chris Faylor also revealed on the Duke Nukem Forever forums today that the PC release of the game will incorporate Valve's Steamworks software. "Regardless of where or how you buy Duke Nukem Forever on PC, your purchase will be tied to your Steam account, ensuring that you'll always be able to install a copy of the game even if you lose your disc," he wrote. Duke Nukem Forever comes out on May 3 for the PC, Xbox 360 and PlayStation 3.